One winter morning I woke up with snow on the ground. I was so happy. I asked Mom if I could play in the snow and she said yes. I quickly got ready and ran outside in the snow to play. 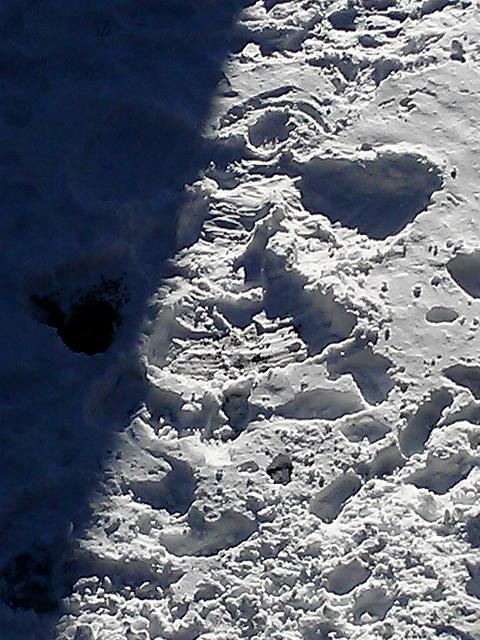 I made a snow angel as soon as I went outside. It was a lot of fun! Then it was night time and we went for a walk in the snow. 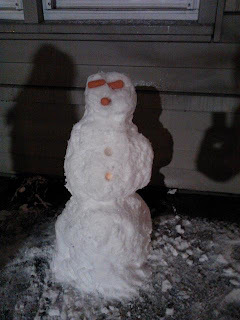 We made a snowman for the front of the house. First I rolled a big snowball for the bottom of the snowman. Then I rolled a medium snowball and put the medium snowball on top of the big snowball. Next I rolled a little snowball and put the little snowball on top of the medium snowball. Finally I decorated my snowman with carrots. I had a fun time in the snow! Your snowman looks lovely! Hope you got some hot chocolate afterwards! Hot chocolate is a must have after playing in the snow 🙂 I always have hot chocolate in the house in the winter! She was so proud of the snowman and was devastated when it either collapsed from melting or somebody destroyed it on her. We did it in the front of the house as it was too dark in the back yard and in the front we get a lot of "foot traffic" going by the house.